With the memory of March’s “bomb cyclone” still fresh in Coloradans’ minds, government agencies, schools and travel hubs across the state are starting to prepare for closures and delays Wednesday and Thursday as another blizzard moves in. With the memory of March’s “bomb cyclone” still fresh in Coloradans’ minds, schools, government agencies and travel hubs across the state are starting to prepare for closures and delays Wednesday and Thursday as another blizzard moves in. Heavy snowfall and winds are expected Wednesday afternoon into Thursday, meaning travel could be dangerous and power outages are possible . A blizzard warning goes into effect at noon until Thursday at noon. As of 10:45 a.m. Wednesday, Denver Public Schools has not issued any delays or closings, and the day was continuing as usual. Aurora Public Schools, Douglas County Schools, Littleton Public Schools, Cherry Creek Schools and Westminster Public Schools have canceled all of their evening activities and after-school care for Wednesday. DPS is monitoring the blizzard expected Wednesday afternoon to Thursday morning. There are no changes to the school day on Wednesday April 10. Please check https://t.co/lbo1BxXyM8 for updates. A few schools said they will close early: RE-1 Valley District-Sterling will close at 12:30 p.m., Haxtun School District RE-2J will close at 12:20 p.m. and Elizabeth School District will close at noon, among others. A few schools, including Kiowa Schools and Lewis-Palmer School District #38, are closed all day Wednesday. You can see the full list of closures and delays here . In addition to schools, the Colorado Rapids postponed their Wednesday game against the Seattle Sounders to Sept. 7. The Rockies game has been postponed for Aug. 26. The city of Denver said it will close at 2 p.m., though the Denver Public Library and Denver Recreation Center will close two hours beforehand. The 24-hour city services will maintain regular operating schedules, which includes those working in snow response, traffic operations, public safety and emergency response operations, the city said. If you see somebody who needs shelter, call 211 or 720-913-2000. Information on shelters is available here . For updates on snow in Denver, call the Denver Snow Line at 720-865-7669. Douglas County Government, the city of Wheat Ridge and the city of Colorado Springs will close at 2 p.m. and Jefferson County Government will close at noon. The city of Westminster will close at 2:30 p.m. For more city and county closures, click here . 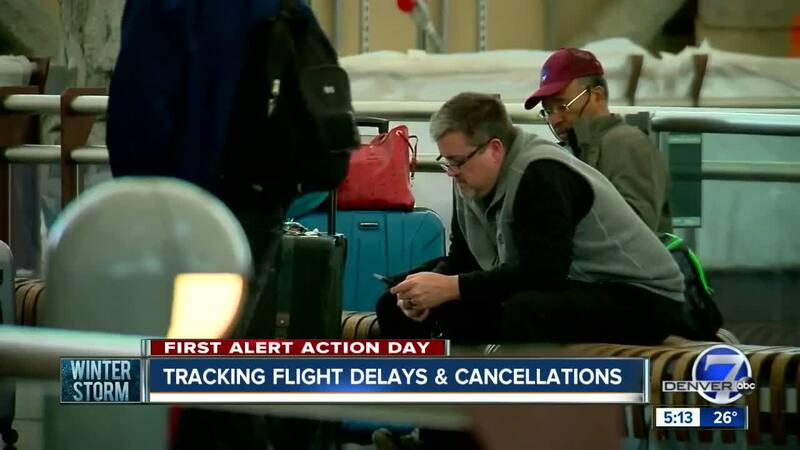 Delta Airlines issued a weather bulletin for April 10 and 11 that included DIA, the Aspen/Pitkin County Airport, Colorado Springs Airport and Grant Junction Regional Airport. Southwest Airlines said they are expecting schedule disruptions in Milwaukee, Denver and Minneapolis/St. Paul and are offering passengers the chance to change their flight at no cost. Frontier Airlines has canceled some flights in and out of the Rocky Mountain region for both Wednesday and Thursday. This includes airports in Colorado, Nebraska, Minnesota, Wisconsin, and North Dakota. United Airlines has offered affected passengers the chance to change their Wednesday or Thursday flight at no cost on their app or by calling the reservations line at 1-800-864-8331.